Do you spend a lot of time on you computer or game console like the Playstation/Xbox ? This is perfect for you ! This battery connects direct to USB and offers unlimited use. 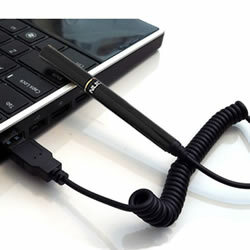 Provided with flexible spiral cord and powered by the USB - never run out of charge again ! Note: Filter shown available separately. Very good idea. I can vape all day when at the computer and save my other batterys for when I am out and about. If you're like me and forever forgetting to recharge your batteries then this is the life saver. I have a couple of these, I've got one plugged into my PC for the convenience of smoking when I'm working/browsing the net. I've also got one in the car along with the NUCIG car adapter so that if my battery runs out of life, I've got an instant ECig powered by the car - really useful for long journeys, the cable is stretchy and long so no worry about awkward positioning. A must buy for the heavy smoker! and super durable too. I enjoy my nucigs all day and with this plugged into my office pc, can use it continously. I use my regular batteries when out and about. This is a great item nucig - well done.